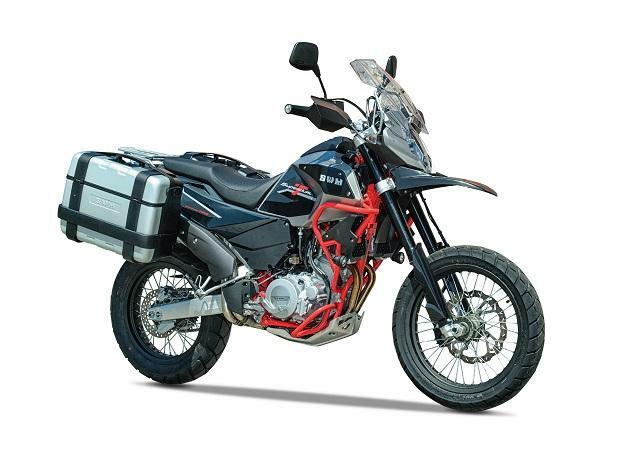 Motoroyale, a multi-brand superbikes venture by Kinetic group, has announced a special introductory price for the SWM Superdual 650 T, a true-bred adventure bike with Italian DNA. While the offer ends on March 31, the offer is only available to the first 250 customers, who will get the bike at a discounted price of RS 6.5 lakhs instead of Rs 7.3 lakhs. All prices ex-showroom. Powered by a 600 cc liquid cooled, single-cylinder, 4-stroke engine that churns out 54 bhp of power & 55 NM of peak Torque, the SWM Superdual 650 T comes with a 6-speed constant mesh gearbox mated to a hydraulic clutch. The bike comes with a 19-inch front and 17-inch rear wheel which is halted by a single 300mm front disc and a 220mm rear disc. The bike also comes with a dual channel ABS, by Brembo and USD telescpoic hydraulic forks are used to take care of the suspension. While the adventure touring scene in Indian motorcycle circuit developing recently, Motoroyale Kinetic is hopeful of cashing in with the increase in demands of bike from international brands. The company retails leading international brands such as MV Agusta, Norton, Hyosung and FB Mondial and have already launched multi-brand dealerships in Thane, Hyderabad, Chennai and Kochi with plans of showrooms in Bangalore, Delhi and other major cities across India.